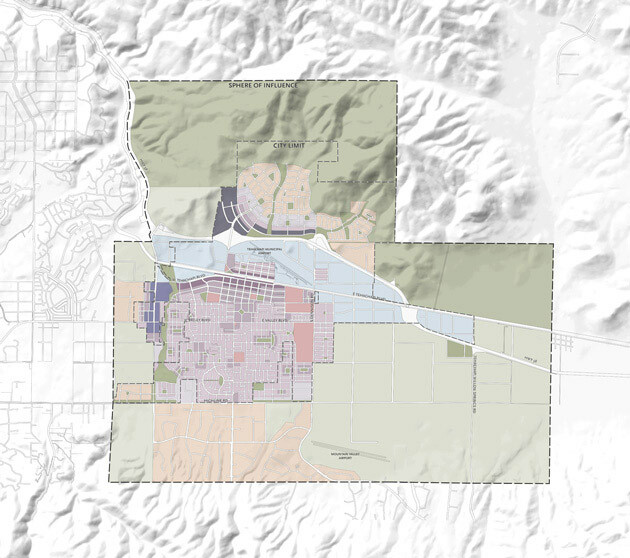 The Tehachapi form-based general plan, based on an urban-to-rural transect, focuses on understanding how this small town can succeed economically while preserving its intrinsic character. A rural mountain town in southern Kern County, Tehachapi has grown rapidly in recent years, resulting in a patchwork of disconnected walled housing tracts, retail buildings in large parking lots and stretches of wide, high-speed arterial streets that have replaced country roads. This was increasingly seen to be incompatible with its small mountain town character. In October 2006, the City retained David Sargent of HDR Town Planning to work with the community to prepare an interim community design program through public workshops and a community design vision charrette, providing a clear vision around which to regroup and pursue its future. In 2008, in conjunction with David Sargent joining the firm, the City of Tehachapi hired Moule & Polyzoides to build on that prior work to update and complete its general plan. An integrated environmental performance framework will address eight community-wide topics through a set of locally calibrated metrics. This framework will help motivate, direct and shape reinvestment to ensure that it adds long-term value and is welcomed by the community. Mixed-use buildings transition to a variety of housing types from Downtown to the Central Neighborhoods. House-scale buildings transition from Downtown's edges to the more residential central neighborhoods.